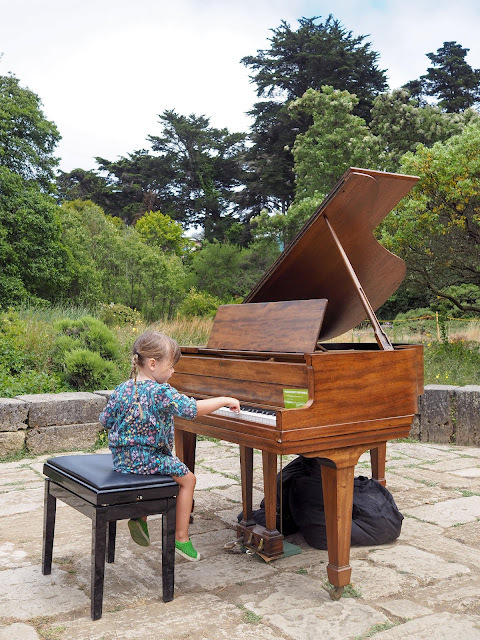 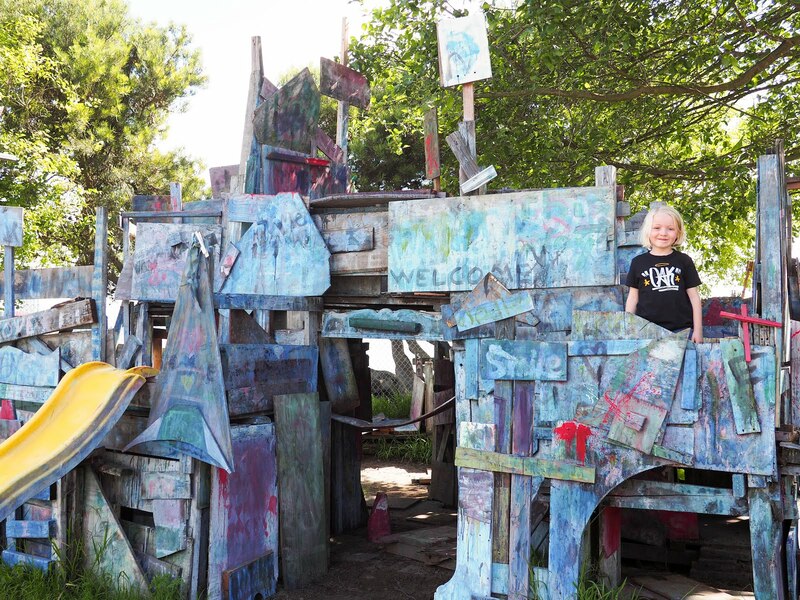 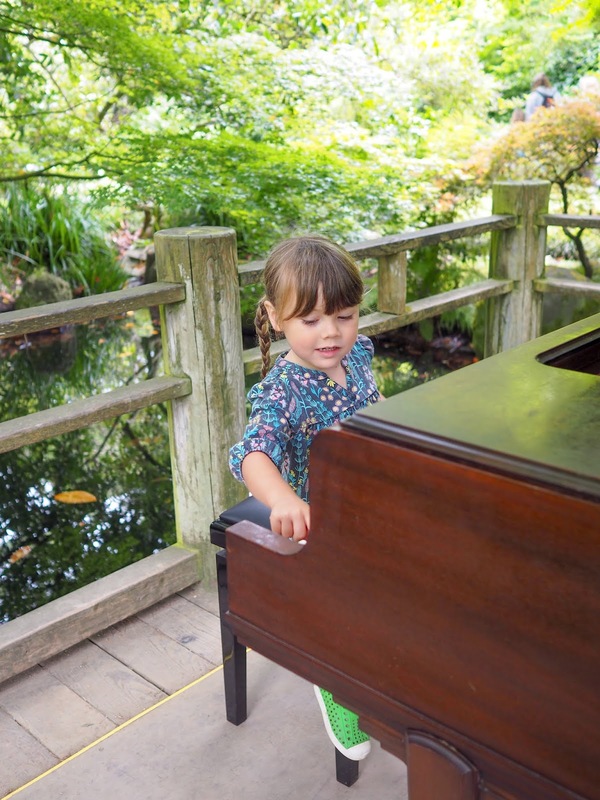 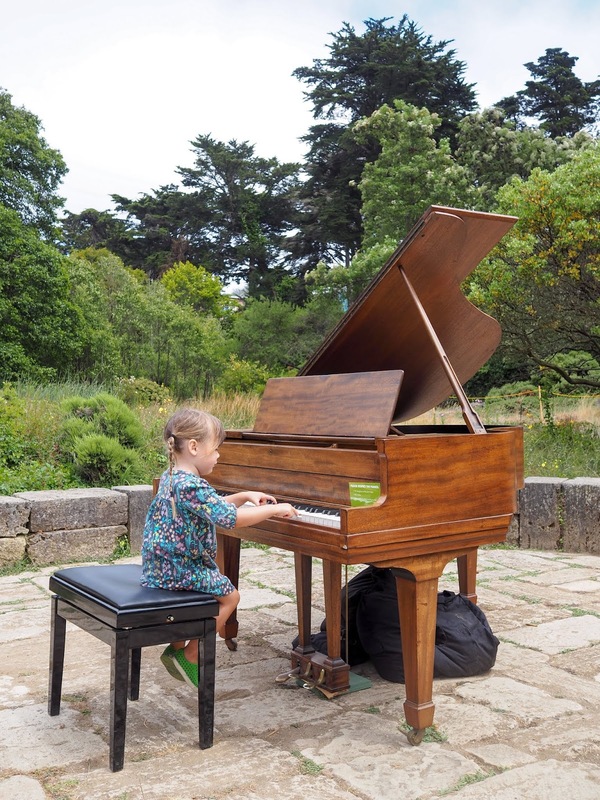 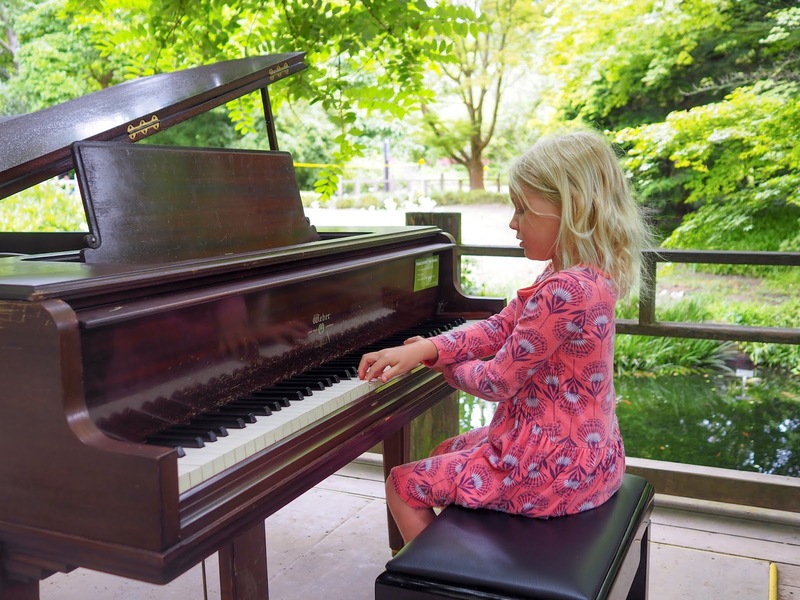 In the past the girls have been able to take a turn on each of the twelve pianos located throughout the garden. 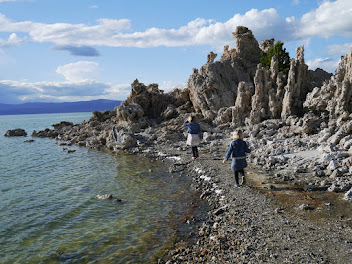 This year however, we did not have as much luck. 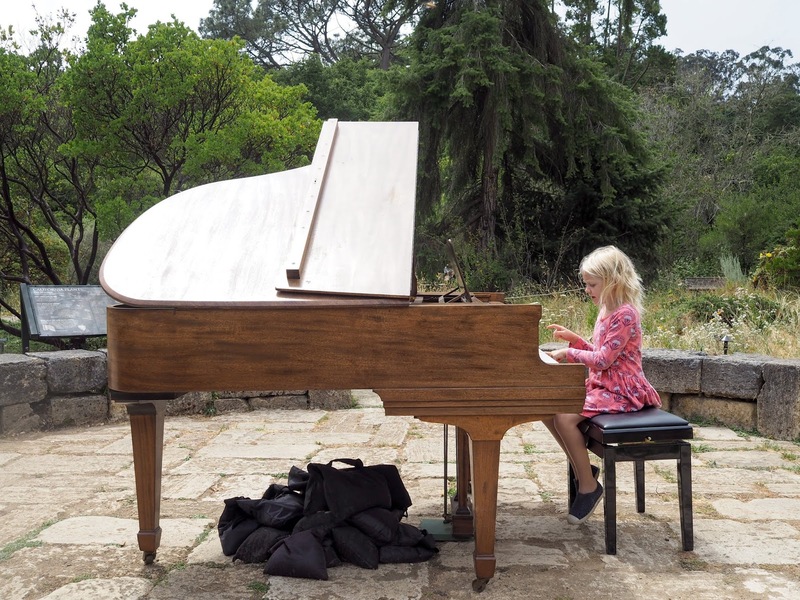 We either arrived at a piano as a performance was happening, or as the piano was being tuned. We seemed to have been following the piano tuners around the garden as this happened at five of the twelve pianos! 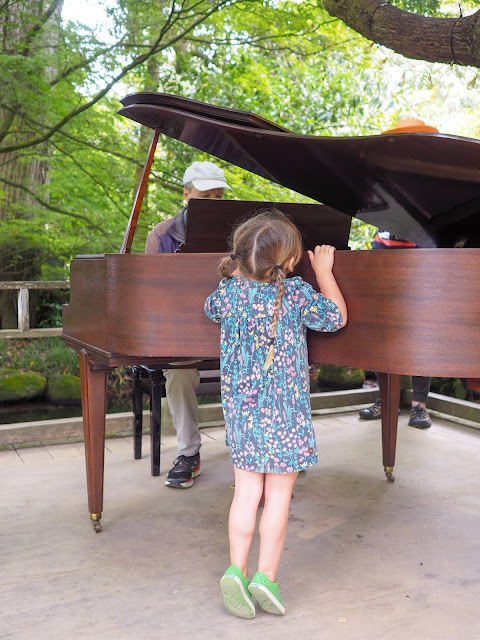 We were able to back track and revisit some of these pianos, but we had limited time and unfortunately could not go back to all of them. 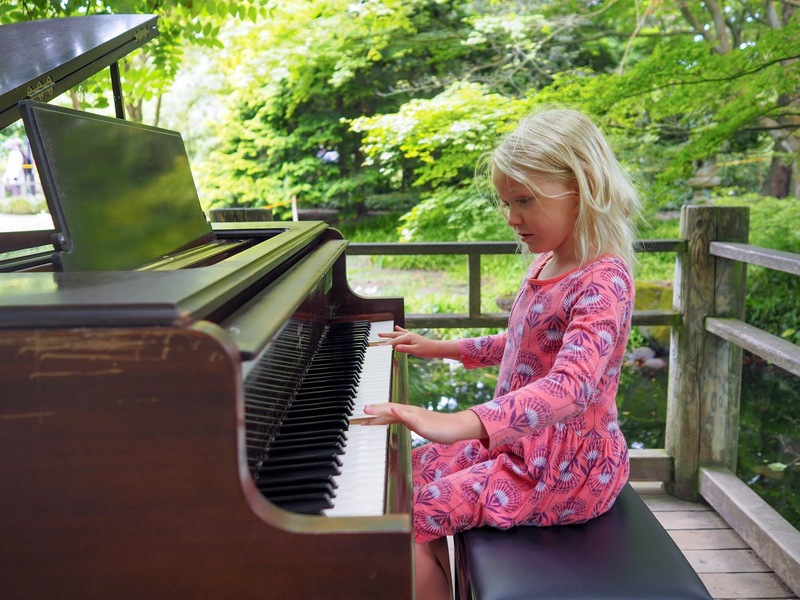 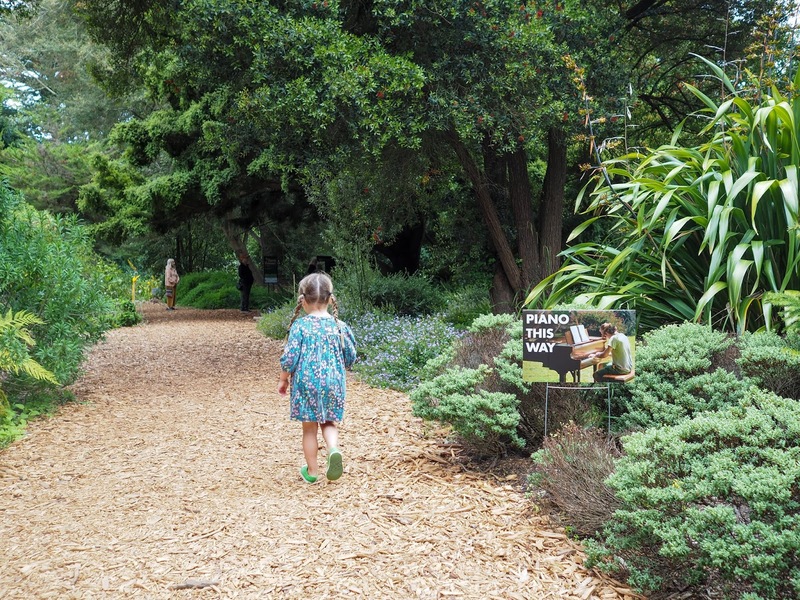 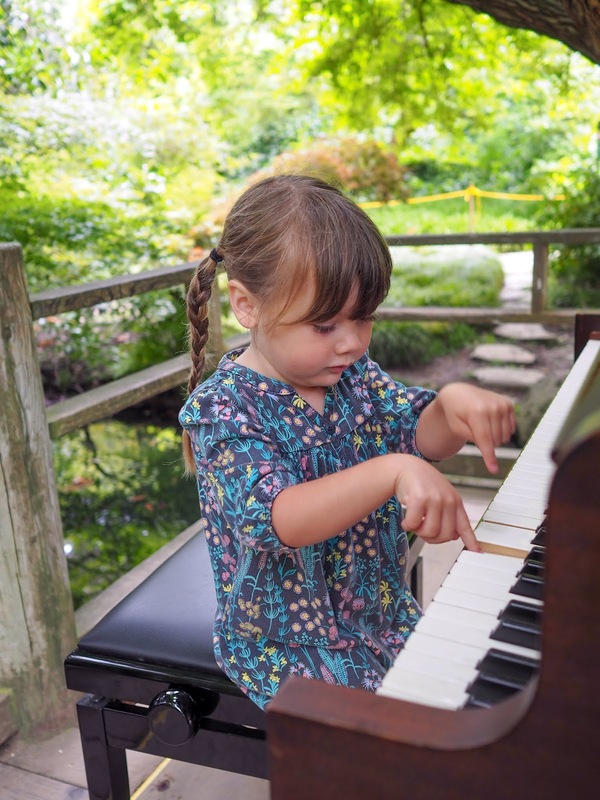 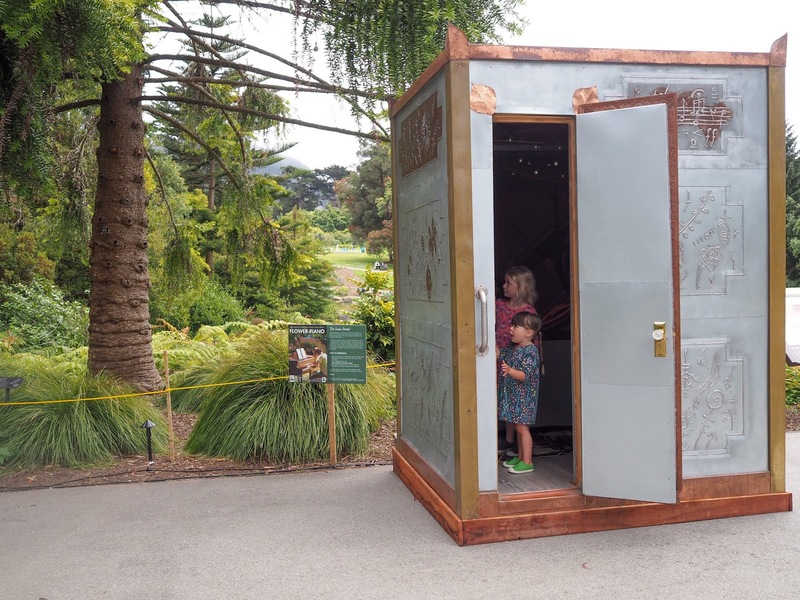 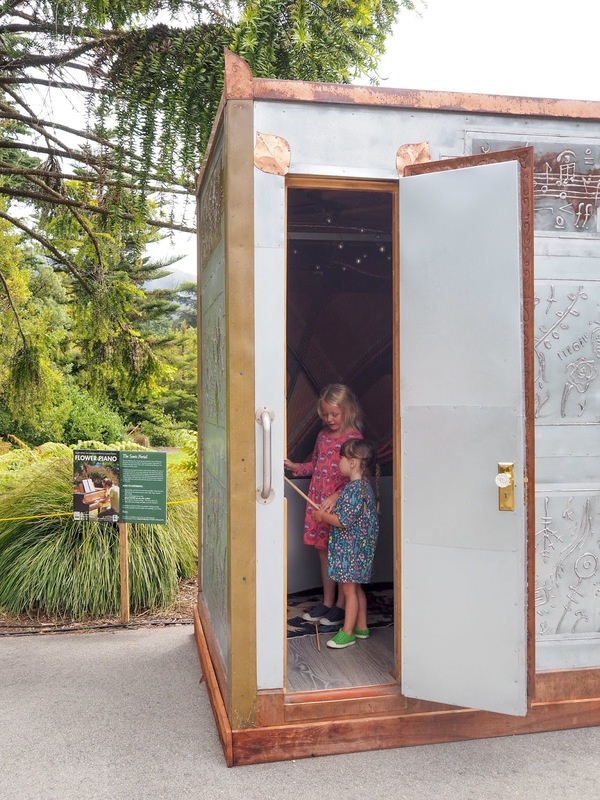 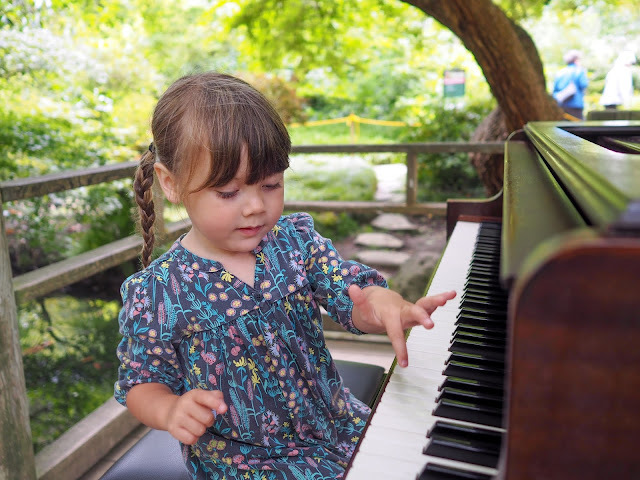 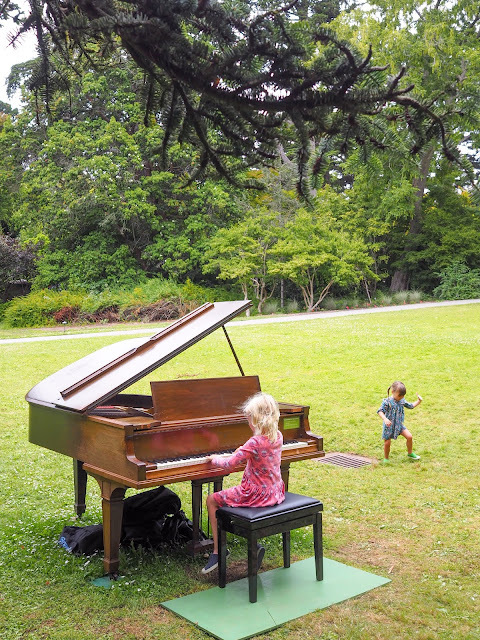 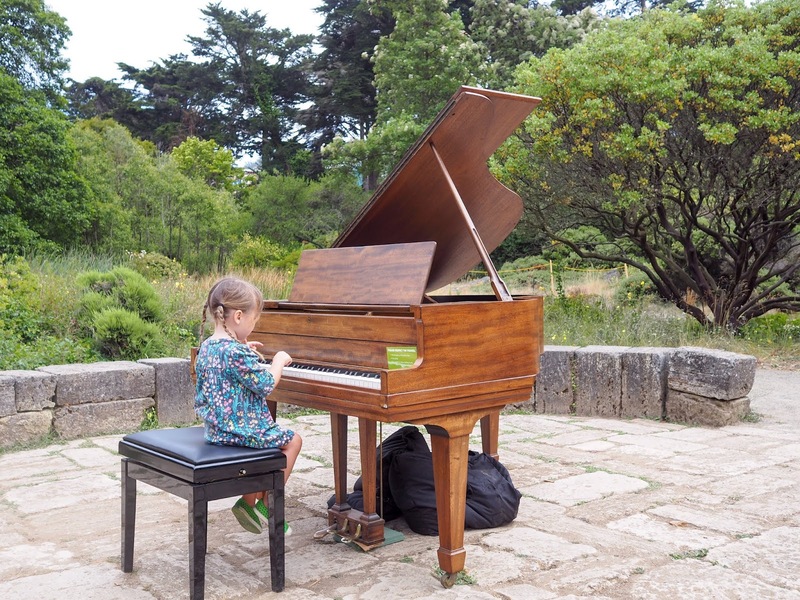 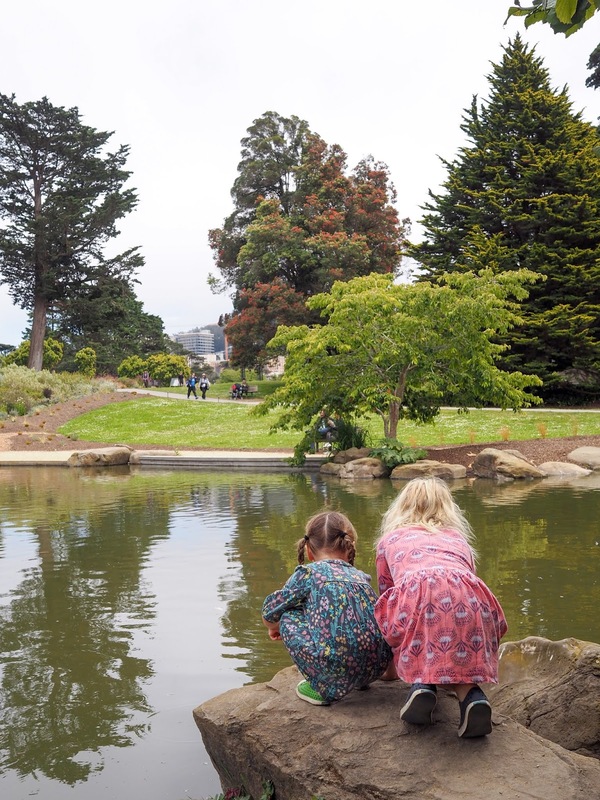 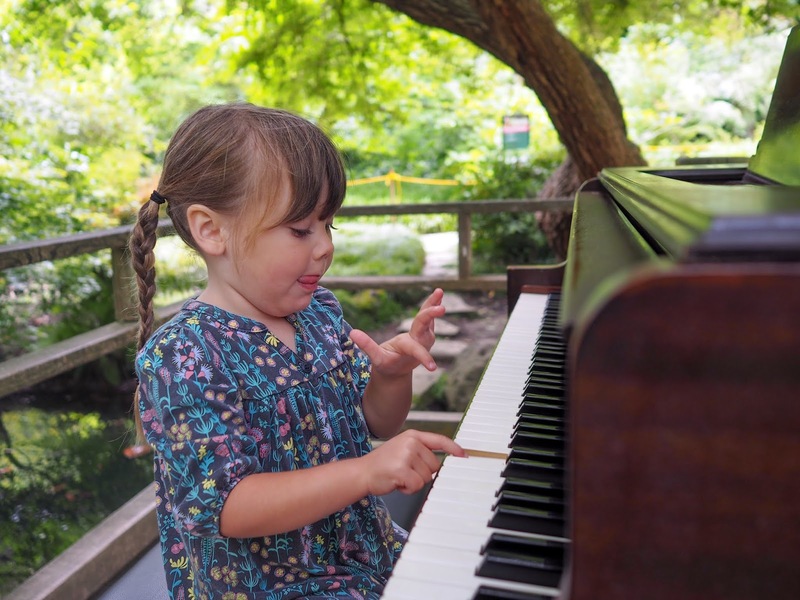 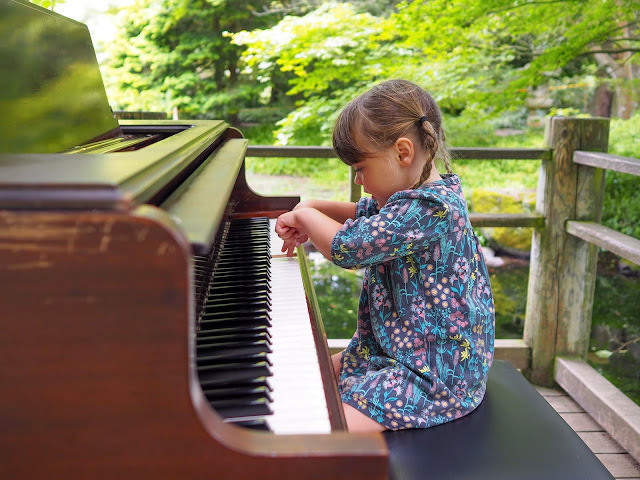 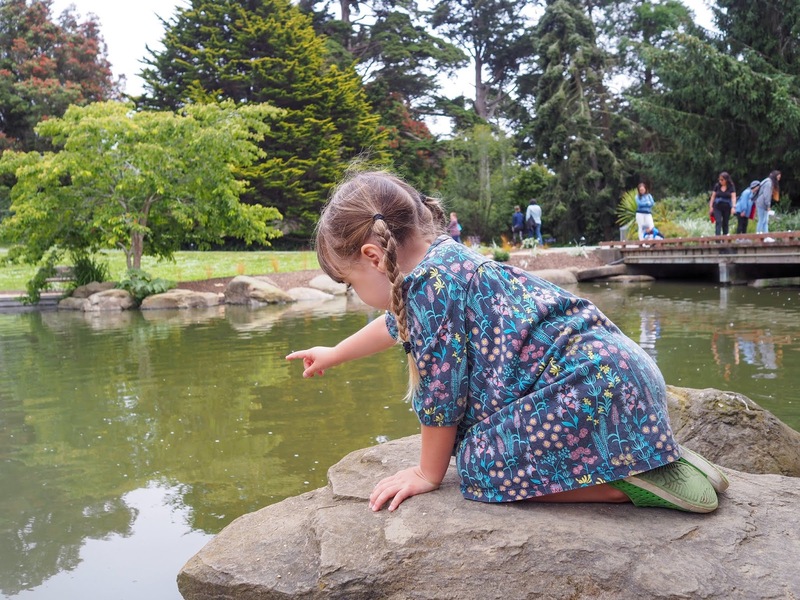 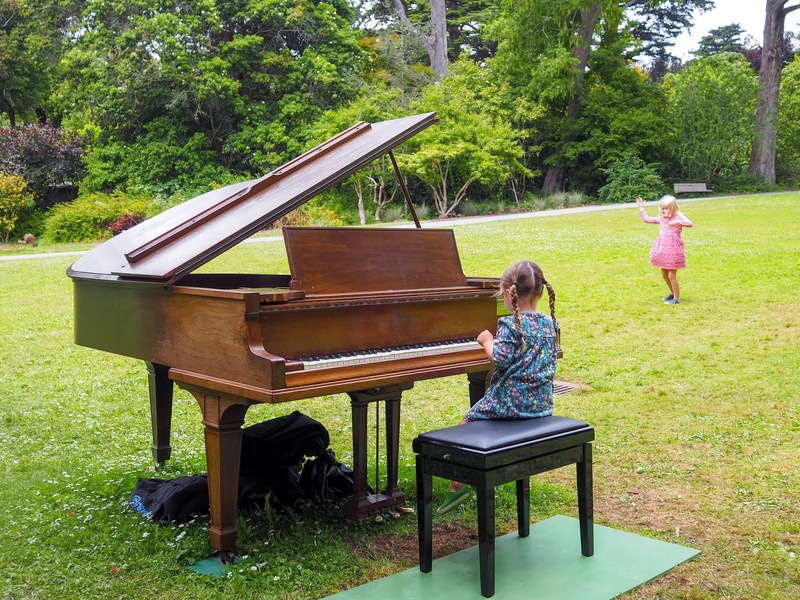 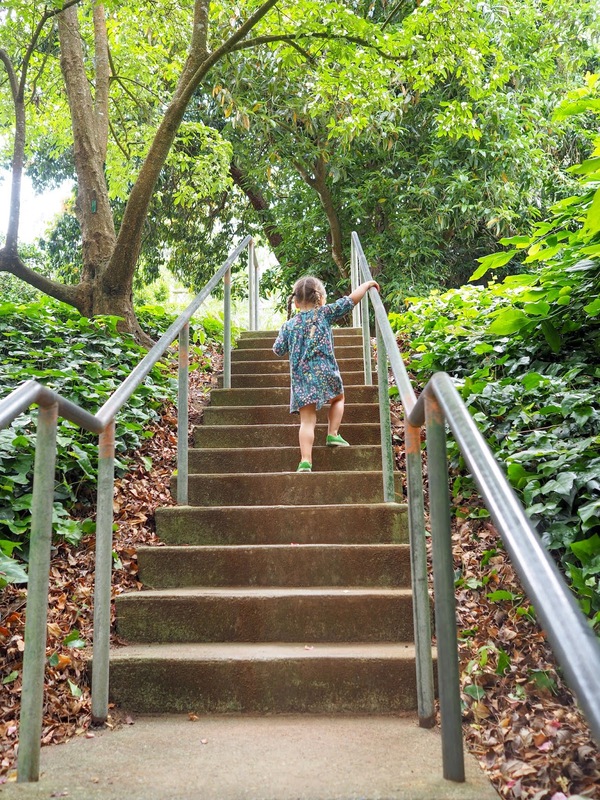 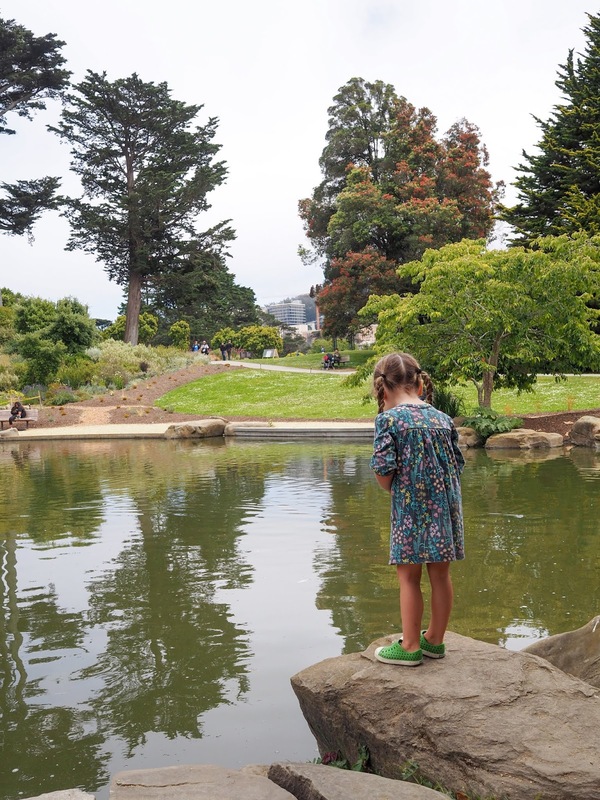 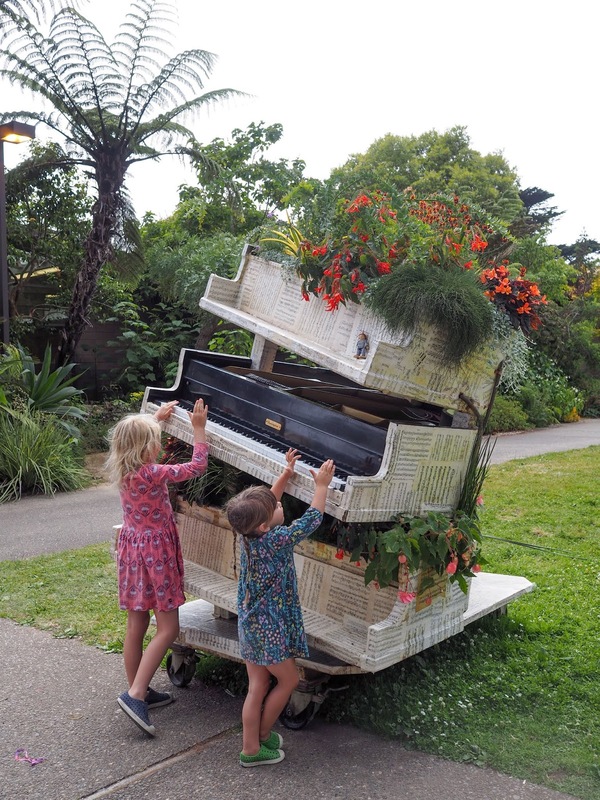 While the girls only got to play four pianos this year (plus two special displays) our visit to the Botanical Garden was still a lovely day out. 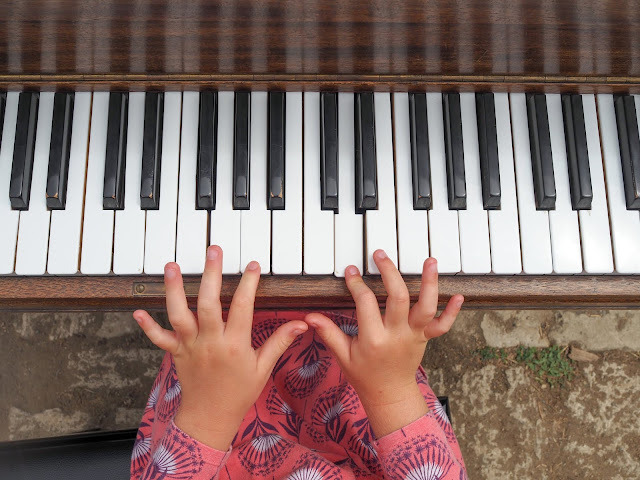 Here's a look at my little "pianists" in action in the garden. 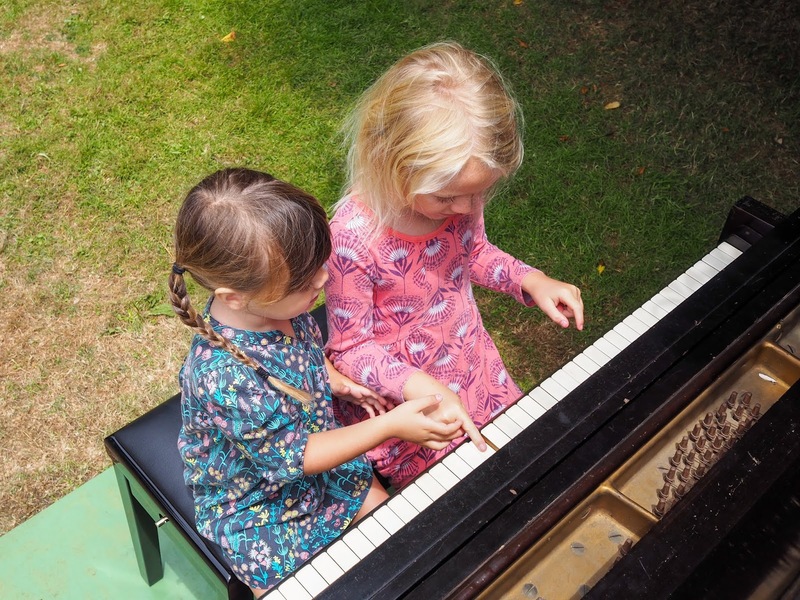 While neither of them actual know how to play piano they were surprisingly very gentle with the instruments - although every "song" they played did end with a big dramatic bashing of the low keys. For the most part, both Lola and Mathilde liked to play their own songs by themselves. They took it in turns playing with the other danced to the music. 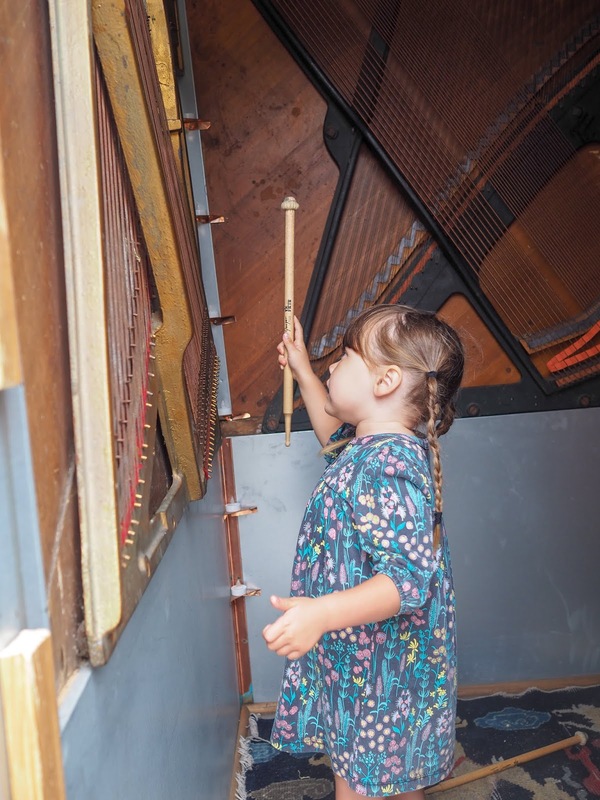 One of the more interesting "pianos" on display was the Sonic Portal, a small room with piano parts hanging on the walls. 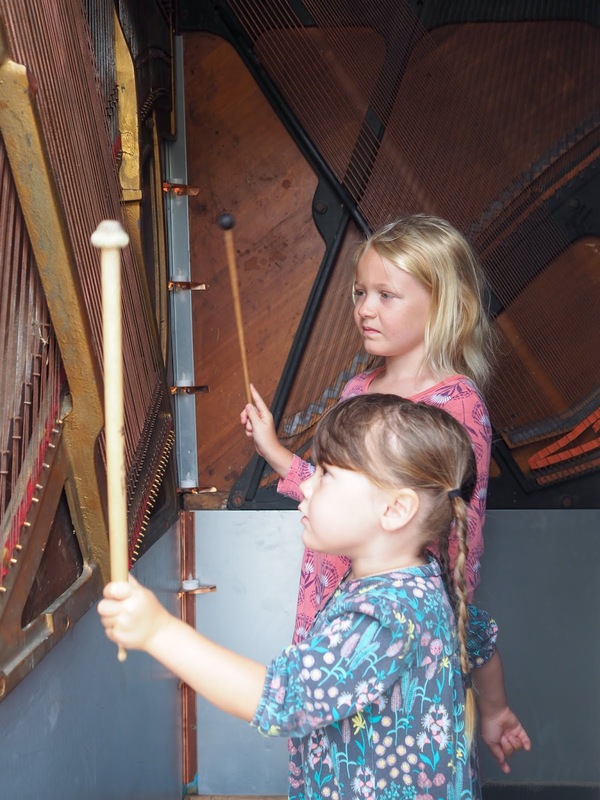 Visitors were invited to use mallets to play notes on the walls. 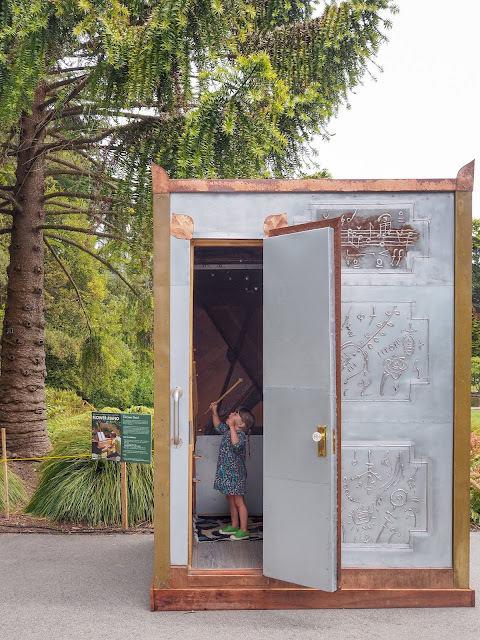 It was pretty loud in there, and quite dark when you closed the door to contain the noise. My girls weren't keen on being in there with the door closed, so they kept the door open and shared their very loud "music" with everyone walking past instead! 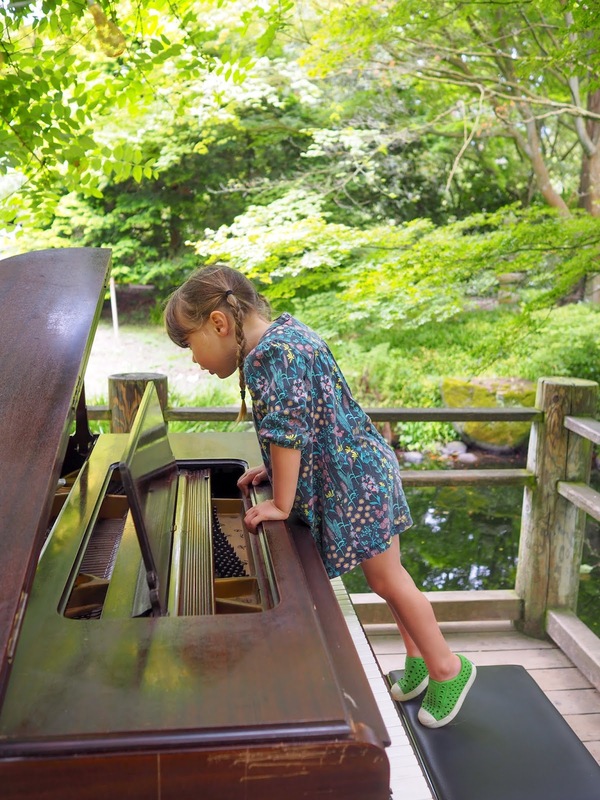 One of my favorite pianos in the garden sits on the deck above the water in the Moon Viewing Garden. 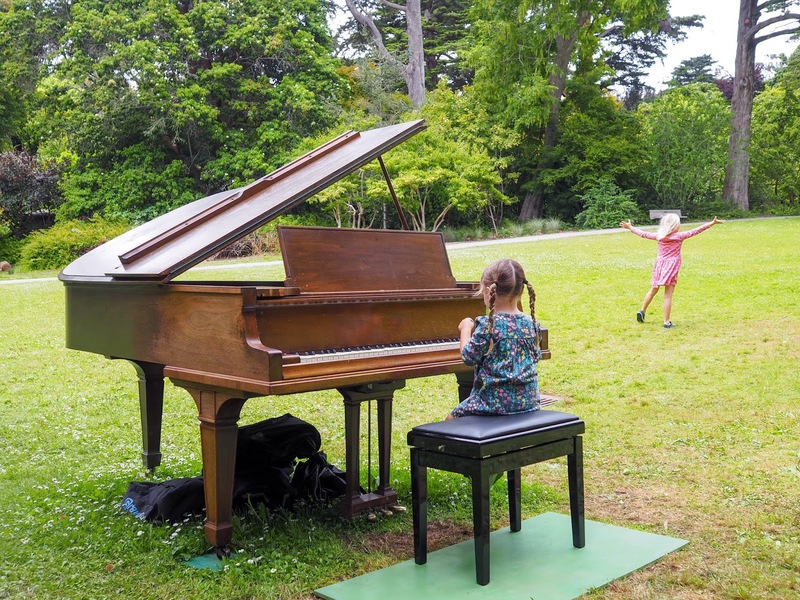 Playing a piano on the lawn surrounded by trees is lovely, but playing a piano on a deck above water surrounded by trees, is so much lovelier. 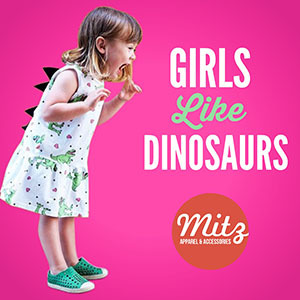 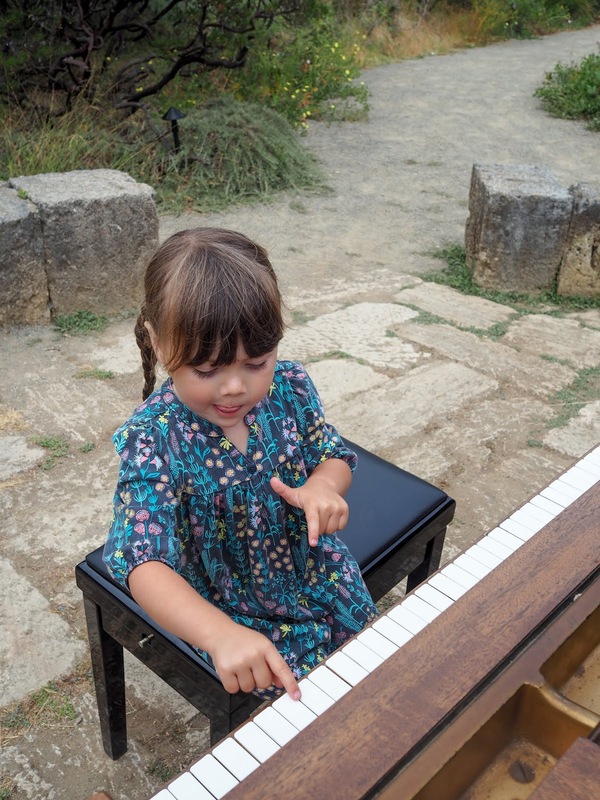 Even when the little pianist doesn't know how to play! 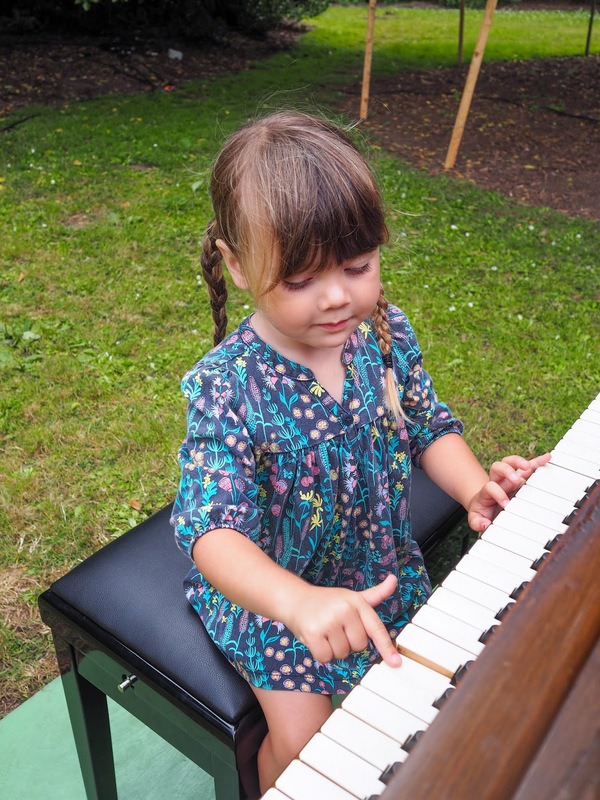 While playing the piano Mathilde noticed the the top was open. 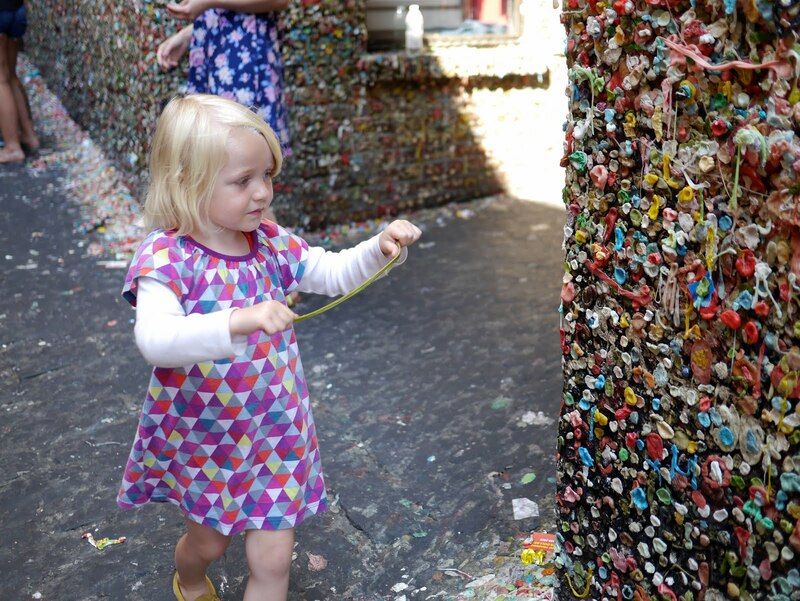 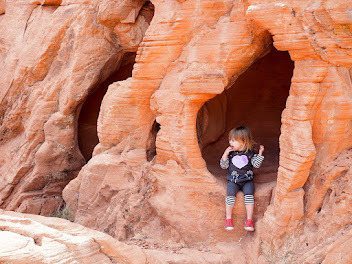 She was keen to check out just what was inside and was amazed to see that it looked just like what she had seen on the walls in the Sonic Portal. 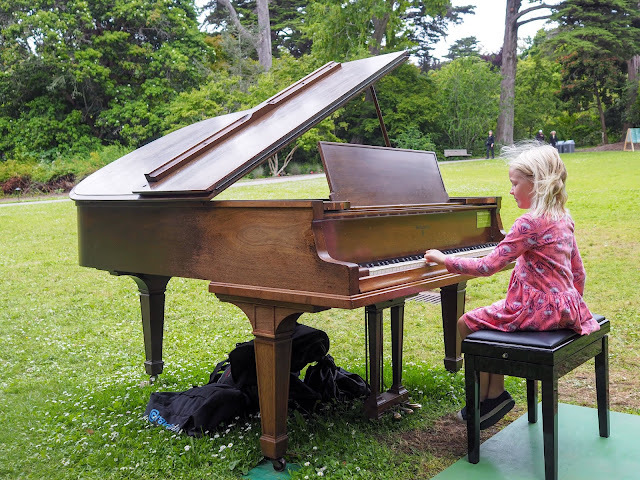 After the girls had finished playing this one we handed the piano over to someone who actually knew how to play and Mathilde watched in awe as the little mallets inside the piano hit the strings to make the music. We took a little break from the pianos to go check out the turtles, fish and geese in the pond. 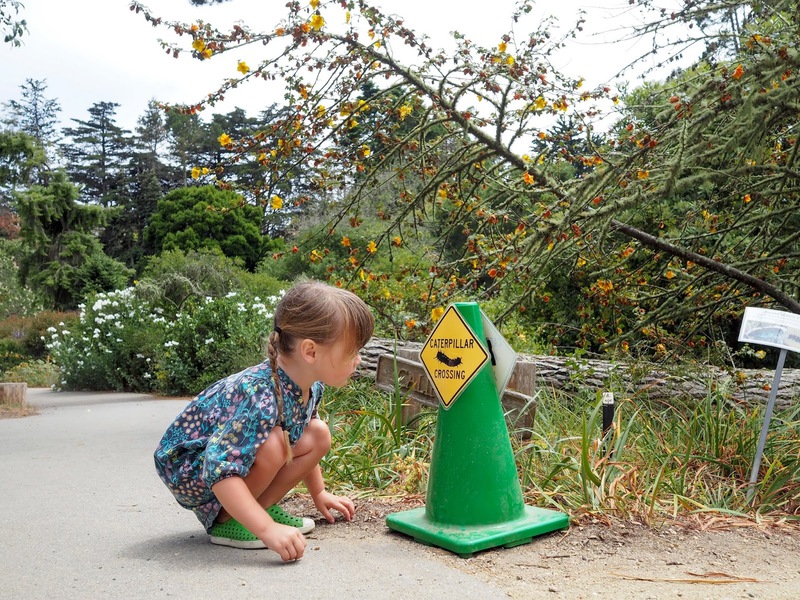 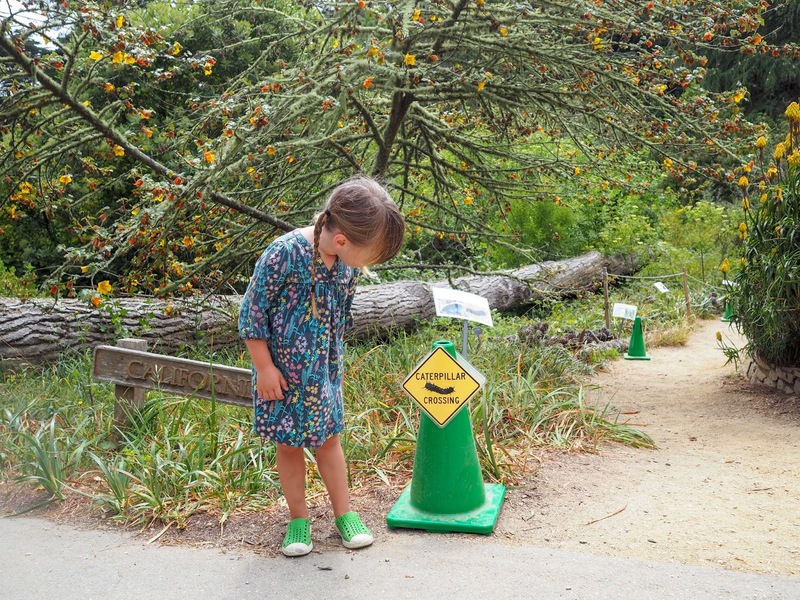 We also came across a caterpillar crossing sign, but we didn't manage to spot any caterpillars. 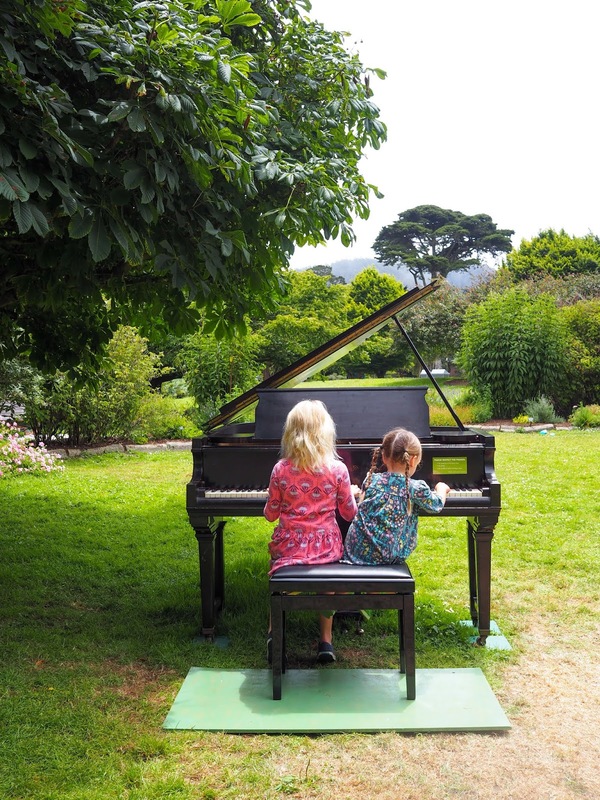 We found one more piano in the garden that the girls were able to play. We did, in fact see all twelve at some point, but as I mentioned earlier those that we didn't play were either being played by performers or were being tuned. 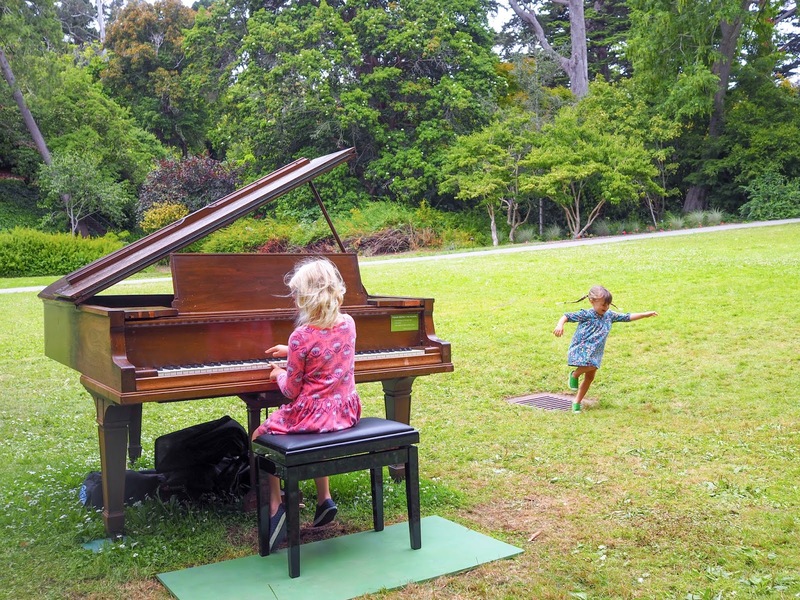 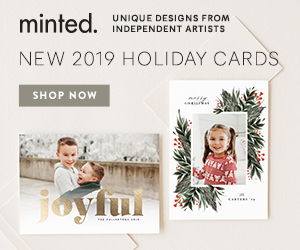 Unfortunately this included my very favorite, the piano under the stunning New Zealand Christmas Tree and the white baby grand in the Great Meadow. By now it was time for us to leave the Botanical Garden and head back to Berkeley. 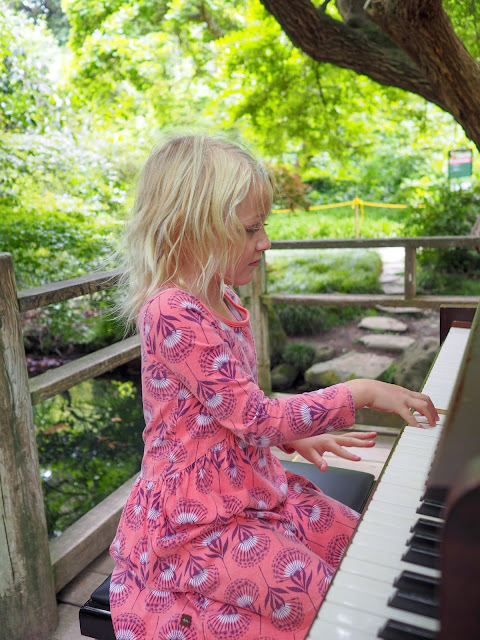 I would've loved to have stayed longer so the girls could have a turn on the rest of the pianos, but by this point we had already been there for over three hours and we had to get back for swim team. 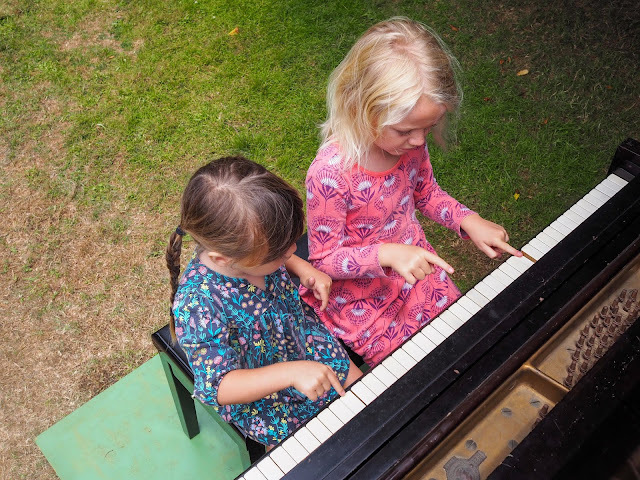 We were in luck though as there was one more piano for the girls to get their hands on. 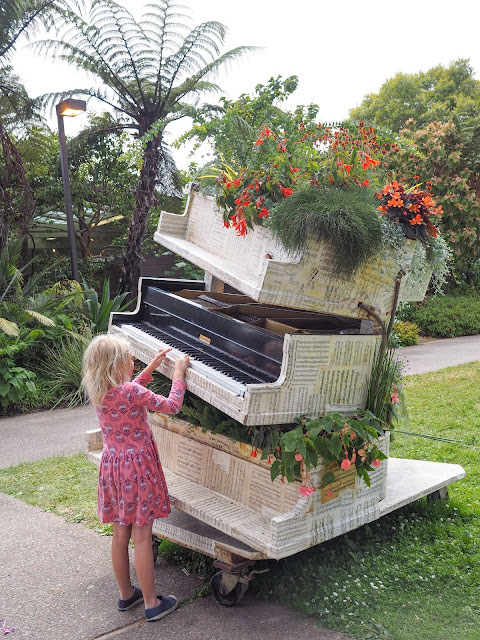 At the entrance of the Botanical Garden there is a stack of flower filled pianos, one of which has its keys intact for visitors to play. 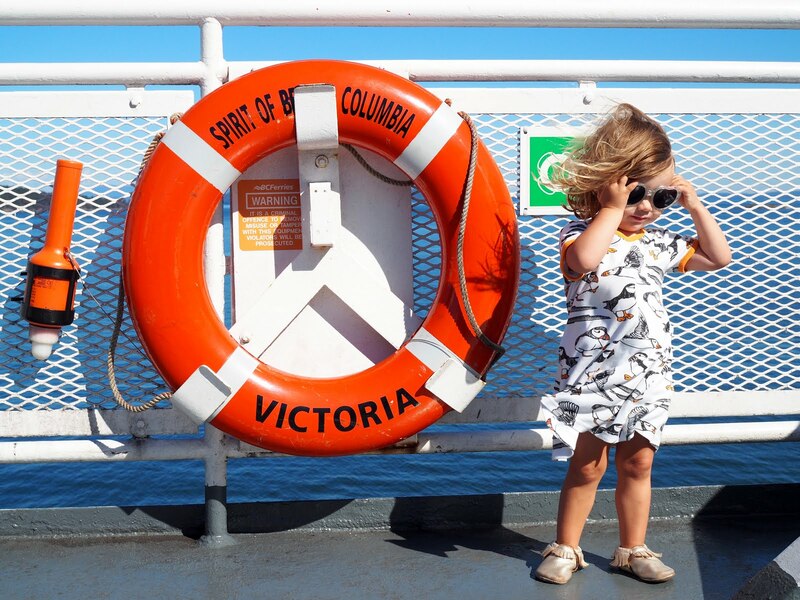 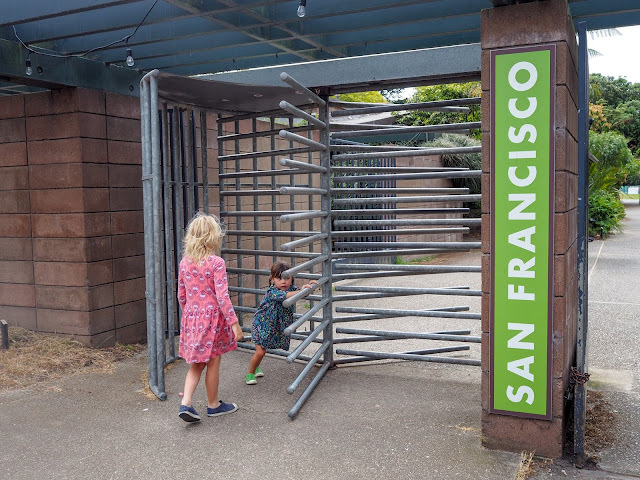 We said goodbye to the Botanical Garden for the day but we'll definitely be back again soon. 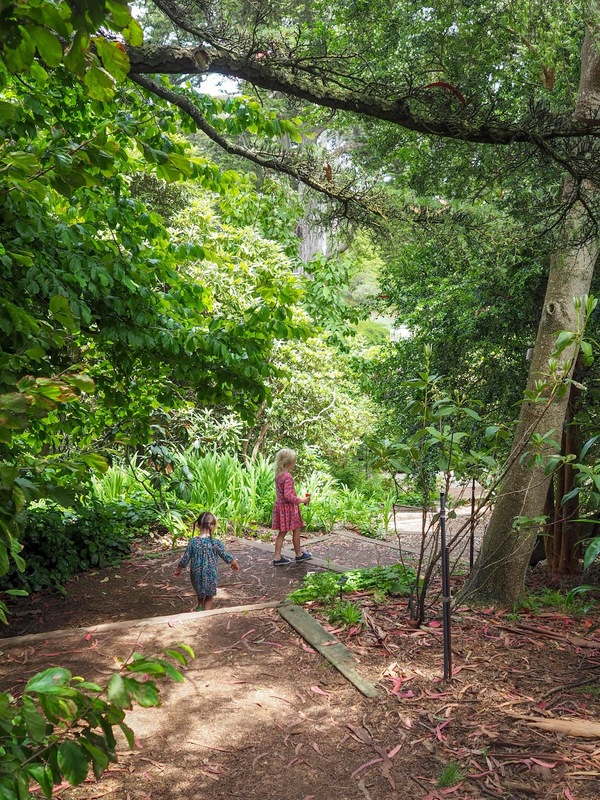 It's such a lovely place to spend the day. 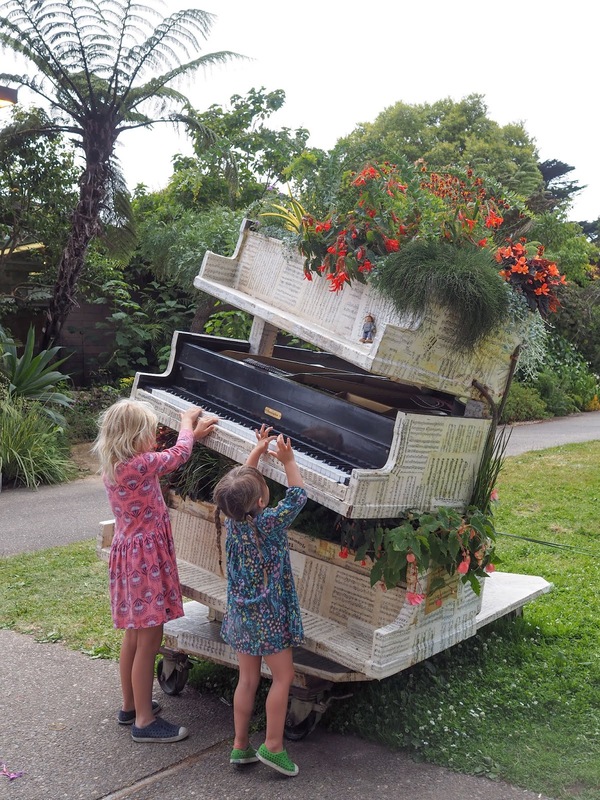 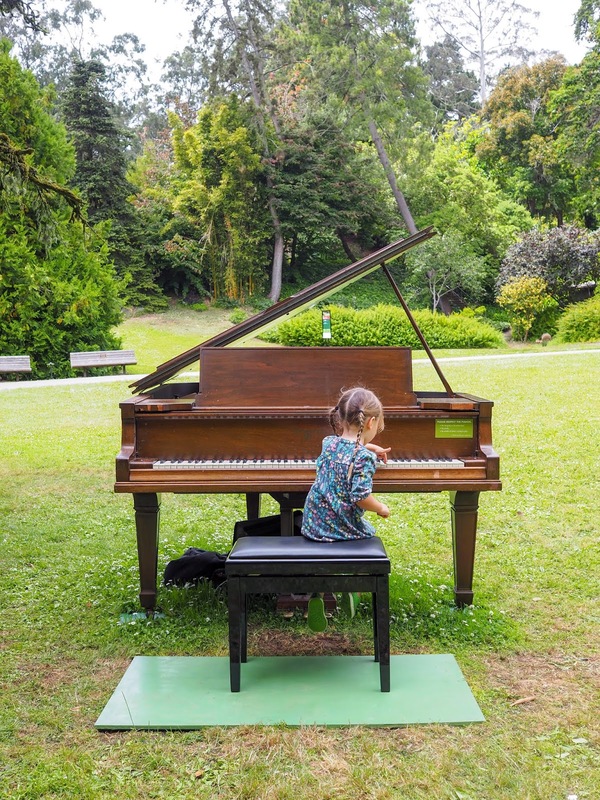 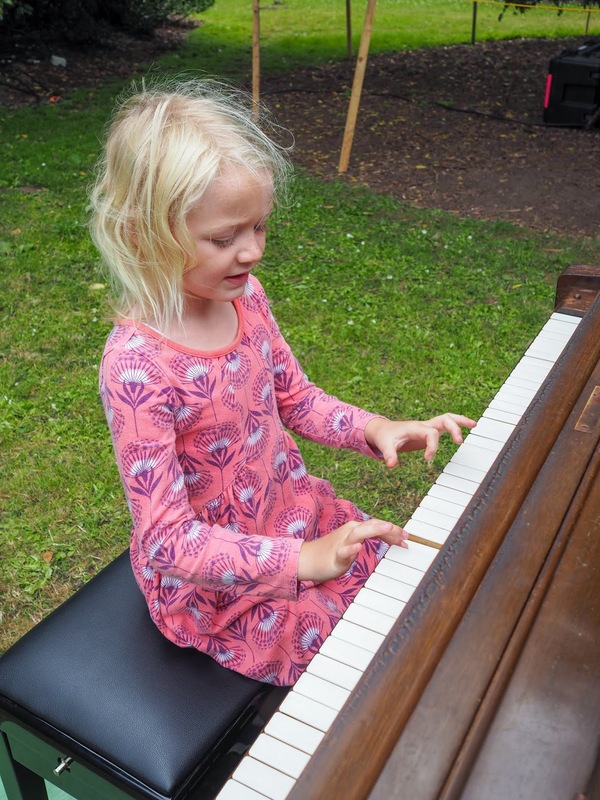 Flower Piano runs from July 5th to 16th with special performances on weekends. 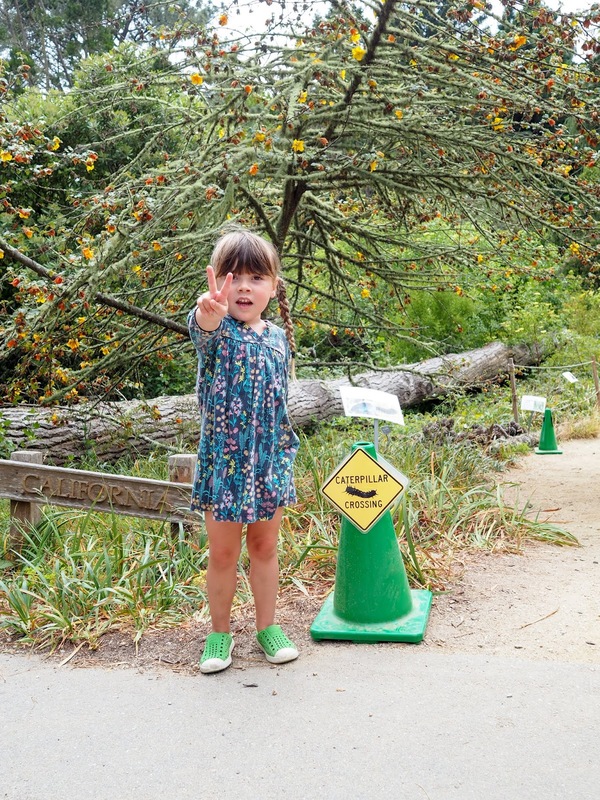 There are only a few days left so if you'd like to check it out this year make sure to do it soon.